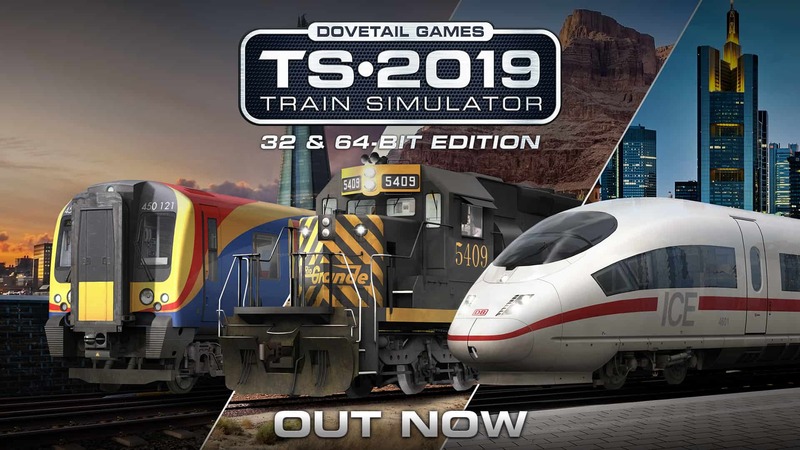 Train Simulator 2019 – Out Now! Climb aboard iconic traction and explore over 280 miles of stunning, scenic and memorable recreations of real-world routes with Train Simulator 2019, available now! The biggest update to Train Simulator in years, it has gone 64-bit! Many of you are proud of the extensive collections you’ve built, and you’ve invested many hundreds of hours into Train Simulator, and so going 64-bit is the best possible thing we can do to ensure your collections continue to be accessible and playable well into the future particularly as computers are always moving forward. The update that includes the 64-bit conversion is free for existing players, and of course ships as part of TS2019 onwards for new players. We’ve also implemented other fixes/additions as part of the core upgrade. See the full TS2019 update here. A true capital-to-coast service, the Portsmouth Direct Line links London’s largest terminus with the historic town of Portsmouth. 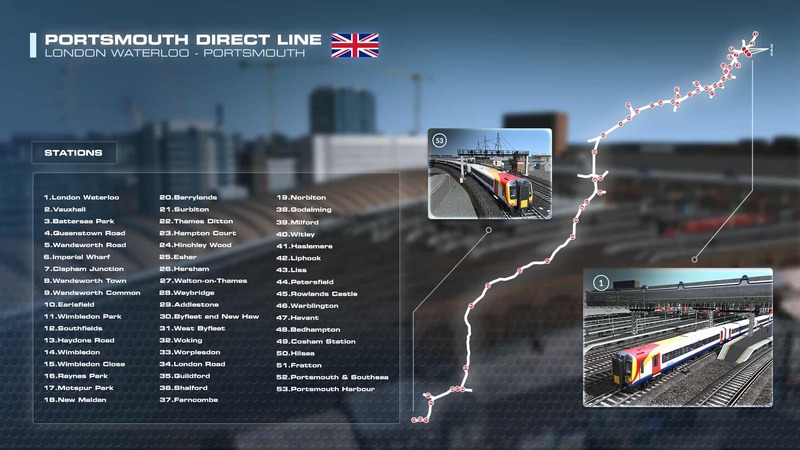 The “Portsmouth Direct” was built to cut down journey times between London and the harbour town, which was previously only served by an indirect route from the west. Calling at major towns en route, and branching off the sprawling main line out of London Waterloo, this route today is 70 miles of non-stop suburban and semi-fast passenger action. A trifecta of South West Trains traction awaits your command, the BR Class 450, BR Class 444, and BR Class 455, as well as the Southern BR Class 377. 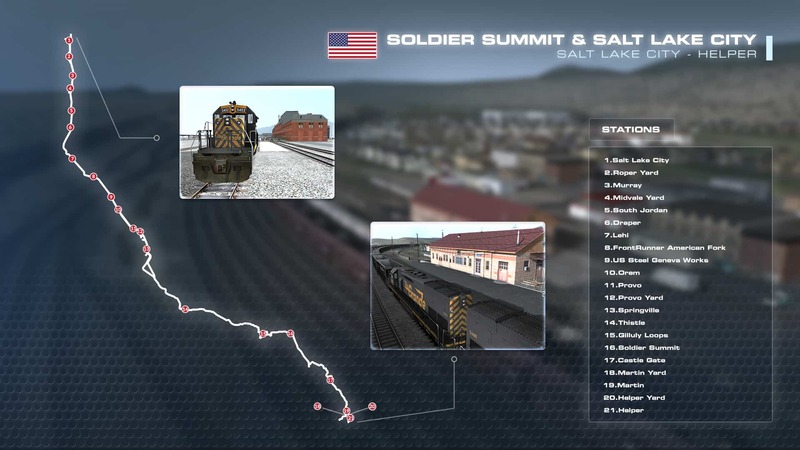 This expanded route delivers the full experience of Rio Grande’s rugged Sixth Subdivision of the railroad’s Utah Division, and motive power for the varied operations comes in the form of D&RGW’s SD40T-2, GP9 and Amtrak’s F40PH locomotives. Covering both the classic lines between Mannheim and Karlsruhe, and the newer, dedicated high-speed link, the Rhine Railway follows its namesake river and sees countless local and international traffic every day, including from Mannheim’s marshalling yard, which is one of the largest in Europe. 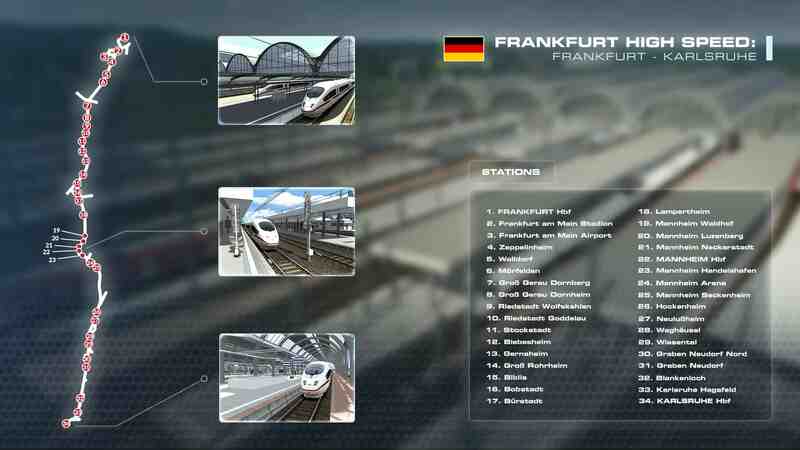 To stretch your legs even further, Frankfurt High Speed expands upon the Rhine Railway, adding the scenic Riedbahn, unlocking key ICE passenger services into the historic and expansive Frankfurt Hbf, as well as the city’s essential rail link to the international airport. You’ll be taking to the Rhine and Ried rails aboard the DB BR 406 ICE 3M, DB BR 189, DB BR 425 and DB BR 294, performing passenger duties and also hauling mixed freight. 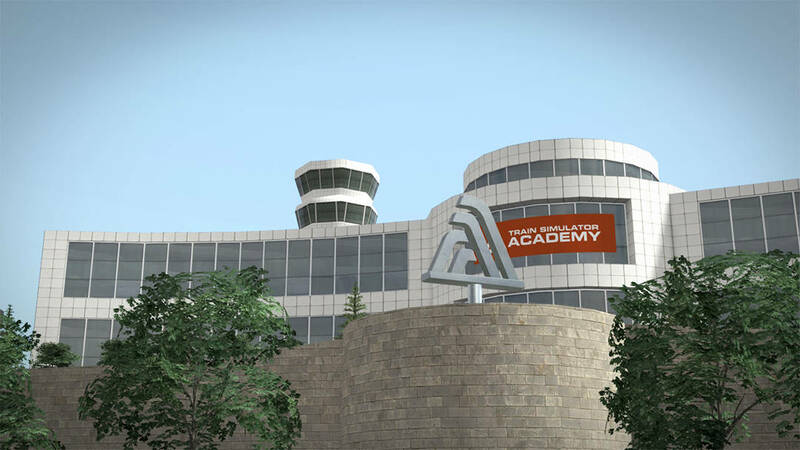 If you are new to Train Simulation, the TS Academy acts as the perfect starting point for you get to grips on a variety of locomotive types and operational procedures, and is set upon multiple short routes depicting various landscapes and differing training environments. At your disposal are the BR 189, Fowler 4F & BR Class 170, plus a selection of rolling stock – you’ll be up to speed in no time with the TS Academy. 45+ mile route set in the late 1970s to depict the final years of Britain’s famed Woodhead Electric Railway, features an all Pro Range cast; the BR Class 76 and BR Class 08 locomotives, as well as the BR Class 506 Electric Multiple Unit. 65 km route that represents the preserved museum railway, the Wutachtalbahn (also known as the Sauschwänzlebahn, or pigtail line) as it is in southern Germany, the Pro Range DB BR 86 is included, with historical Donnerbüchse ‘Thunderbox’ coaches to assist. 70 mile route set in sunny Southeast Florida, recreating a section of CSX’s key Miami Subdivision, which is also served by notable Amtrak services such as the “Silver Star”. For your bay-side rail operations, Amtrak’s P42DC and CSX’s Dash 8-40CW locomotives are included. So, what are you waiting for? If you’re an existing player, your experience has been transformed, and if you’re ready to hop on-board, there is no better time! 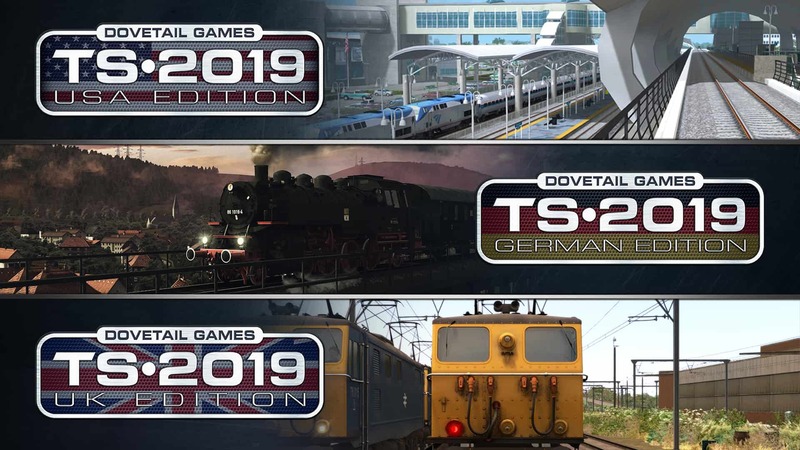 Train Simulator 2019 is a culmination of almost a decade of work and we’ve seen all kinds of routes, locomotives and marketplace packs come out in that time - all eager to be tested in 64-bit! To celebrate the launch we’re happy to announce the ‘Classics Sale’ will be kicking off today on Steam - half price on all of our already reduced Classics products means there’s loads of options for you to expand your TS19 collection. The really crazy thing? There are 64 products in the Classics range right now, so go check out the 64 offers we’ve got out to celebrate 64-bit! See what is better with 64-bit.